The Endeavour River (Guugu Yimithirr: Wabalumbaal), inclusive of the Endeavour River Right Branch, the Endeavour River South Branch, and the Endeavour River North Branch, is a river system located on Cape York Peninsula in Far North Queensland, Australia. The river system comprises three branches that are sourced by runoff from the Henderson and Audaer Ranges. The river flows generally east from the Great Dividing Range to the Coral Sea. The Right Branch of the river rises northwest of Hopevale at an elevation of 335 metres (1,099 ft) and flows generally south by east for 48 kilometres (30 mi) before reaching its confluence to join with the Endeavour River northwest of Cooktown, and west of the river mouth. The South Branch of the river rises near Alderbury at an elevation of 109 metres (358 ft) and flows generally east for 20 kilometres (12 mi) before forming confluence with the North Branch to form the Endeavour River. The North Branch of the river rises below Honeysuckle Flat at an elevation of 160 metres (520 ft) and flows generally west and then south for 20 kilometres (12 mi) before forming confluence with the South Branch to form the Endeavour River. Having been formed by the South and North Branches, the Endeavour River rises below Flaggy at an elevation of 39 metres (128 ft) and flows generally east towards its mouth with the Coral Sea at Cooktown, flowing through the Endeavour River National Park for the last few kilometres of its course. The Endeavour River has a catchment area of 1,315 square kilometres (508 sq mi). In recent years, tilapia fish, which are considered an "invasive species" in Australia, have infested the river, causing concern that the stocks of native fish will suffer. The river basin remains largely unmodified and the water quality is rated as good. James Cook, RN named the river in 1770 after he was forced to beach his ship, HMS Endeavour, for repairs in the river mouth, after damaging it on Endeavour Reef. Joseph Banks named the river the Endeavours River but the form Cook used, Endeavour River, has stuck. Cook and his crew remained for almost seven weeks and made contact with the local Guugu Yimithirr Aborigines, while the naturalists Joseph Banks and Daniel Solander made extensive collections of native flora, while Sydney Parkinson illustrated much of the flora and fauna of the region. Botanical specimens were also collected by Alan Cunningham after he arrived on HMS Mermaid, captained by Philip Parker King on 28 June 1819. Modern Cooktown which has a population of about 2,000, is located at the mouth of the Endeavour River. It is one of the northernmost towns on the East Coast of Australia and was founded in 1873, around the site of Cook's landing, as a port to service the newly discovered Palmer River Goldfields. Some of the relatively undisturbed natural features near the mouth of the river have been reserved in the Endeavour River National Park. ^ a b Shay, John; Shay, Bev (eds.). The Endeavour at the Endeavour: Cook's and Bank's journals from 11 June to 4 August 1770. Cooktown and District Historical Society. ^ a b "Map of Endeavour River, QLD". Bonzle Digital Atlas of Australia. Retrieved 27 October 2015. ^ a b "Map of Endeavour River Right Branch, QLD". Bonzle Digital Atlas of Australia. Retrieved 27 October 2015. ^ a b "Map of Endeavour River South Branch, QLD". Bonzle Digital Atlas of Australia. Retrieved 27 October 2015. ^ a b "Map of Endeavour River North Branch, QLD". Bonzle Digital Atlas of Australia. Retrieved 27 October 2015. ^ Howley, Christina; Brooks, Andrew; Olley, Jon; Carroll, Jason (March 2012). Annan and Endeavour River Freshwater and Estuarine Water Quality Report: An Assessment of Ambient Water Quality and Effects of Land Use: 2002 - 2009 (PDF). Cooktown, Queensland: Cape York Marine Advisory Group Incorporated. p. 11. Retrieved 23 October 2015. ^ "Assessment of River Condition - Endeavour River". Australian Natural Resources Atlas. Department of Sustainabililty, Environment, Water, Population and Communities. 6 May 2009. Archived from the original on 2 June 2011. Retrieved 15 August 2011. ^ Collingridge, Vanessa (February 2003). Captain Cook: The Life, Death and Legacy of History's Greatest Explorer. Ebury Press. ISBN 0-09-188898-0. Endeavour River National Park is a national park in Queensland, Australia, gazetted to protect and preserve some of the natural and cultural resources in and around the mouth of the Endeavour River, immediately north of the small town of Cooktown. 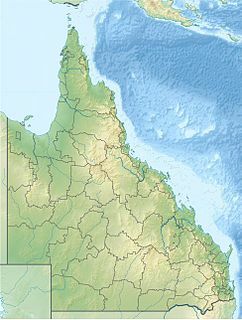 The park is located 1,561 kilometres (970 mi) northwest of Brisbane. The Guugu Yimithirr, also known as Kokoimudji, are an Australian Aboriginal tribe of Far North Queensland, many of whom today live at Hopevale, which is the administrative centre of Hopevale Shire. At the 2011 census, Hopevale had a population of 1,005 people. It is about 46 km from Cooktown by road. It is also the name of their language. They were both a coastal and inland people, the former clans referring to themselves as a "saltwater people". The Severn River, a perennial river that forms part of the Border Rivers group, is part of the Macintyre catchment of the Murray-Darling basin, located in the Darling Downs region of Queensland, Australia. The Mackenzie River is a river located in Central Queensland, Australia. The Mackenzie River is a major tributary of the Fitzroy River, part of the largest river catchment flowing to the eastern coast of Australia. The Normanby River, comprising the East Normanby River, the West Normanby River, the East Normanby River North Branch, the East Normanby River South Branch and the Granite Normanby River, is a river system located in Far North Queensland, Australia. The Annan River is a river located in the Wet Tropics of Far North Queensland, Australia. The Moonie River, a perennial river of the Barwon catchment within the Murray–Darling basin, is located in the Southern Downs district of Queensland and Orana district of New South Wales, Australia. The Belyando River, including the Belyando River , is a river system located in Central Queensland, Australia. At 1,054 kilometres (655 mi) in length and with a catchment area of 35,000 square kilometres (14,000 sq mi), the Belyando River system is one of the longest rivers in Queensland. The Johnstone River, comprising the North Johnstone River and the South Johnstone River, is a river system located in Far North and North Queensland, Australia. The Comet River is a river located in Central Queensland, Australia. The Mulgrave River, incorporating the East Mulgrave River and the West Mulgrave River, is a river system located in Far North Queensland, Australia. The 70-kilometre (43 mi)-long river flows towards the Coral Sea and is located approximately 50 kilometres (31 mi) south of Cairns. The Ward River, part of the Murray-Darling basin, is a river located in Central West Queensland, Australia. The Boyne River is a river located in the Wide Bay–Burnett region of Queensland, Australia. The Yappar River is a river located in the Gulf Country region of Far North Queensland, Australia. The Esk River is a river located in the Wet Tropics of Far North Queensland, Australia. The Langlo River, a river that is part of the Murray-Darling basin, is located in South West Queensland, Australia. The Connors River is a river and anabranch located in Central Queensland, Australia. The Don River is a river located in Central Queensland, Australia. The Styx River is a river in the western portion of Central Queensland, Australia.